Where Lasting Character Meets Local Convenience. In collaboration with Shop Small and San Francisco’s small business advocates, Shop & Dine in the 49 is a buy local campaign which promotes local businesses and challenges residents to do their shopping and dining within the 49 square miles of San Francisco. People employed by San Francisco’s 3,300+ restaurants, bars, clubs and fairs, generating $5.2 billion in economic activity. Launched on November 28, 2015, as part of Small Business Saturday, Shop & Dine in the 49 is San Francisco’s Buy Local campaign. In collaboration between the City and the local business community, with a focus on bringing spending back into our diverse neighborhoods, Shop and Dine in the 49 had a soft launch in November of 2014. The pilot was well received by both merchants and residents thus leading to a consortium of small business advocates who asked that the program be expanded and exist on a yearlong basis. Every dollar spent at local businesses in San Francisco directly supports jobs and the local economy. A 1% increase in spending at restaurants and retailers would generate an additional $100 million into our economy, and helps keep diverse neighborhoods filled with unique small businesses that have much to offer. San Francisco is experiencing its lowest unemployment rate in years – 3.2 percent. In order to build and maintain a strong economic foundation, we must ensure our City’s rising prosperity benefits every San Franciscan including our business community. Small businesses are the backbone of our local economy, they add character to our city and enliven our neighborhoods while employing approximately 326,000 residents. The citywide campaign Shop & Dine in the 49 raises the visibility and importance of buying local. SF Biz Connect is a buy local initiative that aims to increase local business-to-business(BtoB) relationships. The benefits of buying local are not also immediate to large businesses and smaller businesses may have obstacles navigating the procurement processes of large businesses. This program aims to mitigate these challenges by facilitating targeted procurement events, educational panels, and online buy local resources. In addition, the Office of Economic and Workforce Development (OEWD) in partnership with the San Francisco Center for Economic Development (SFCED) actively recruits larger businesses to pledge a shift of at least 5% of purchasing to small and local businesses within San Francisco. SF Biz Connect provides a platform for large businesses to search and connect with local small businesses in San Francisco. Local snack food producers met with procurement staff of businesses that provide snack foods to clients, employees, and/or as retail. These businesses took an hour and a half of their day to speed meet and greet with our participants. Multiple connection made that day have led to actual contracts. Large businesses shared what they look for in a vendor and small businesses shared how they got their foot in the door. 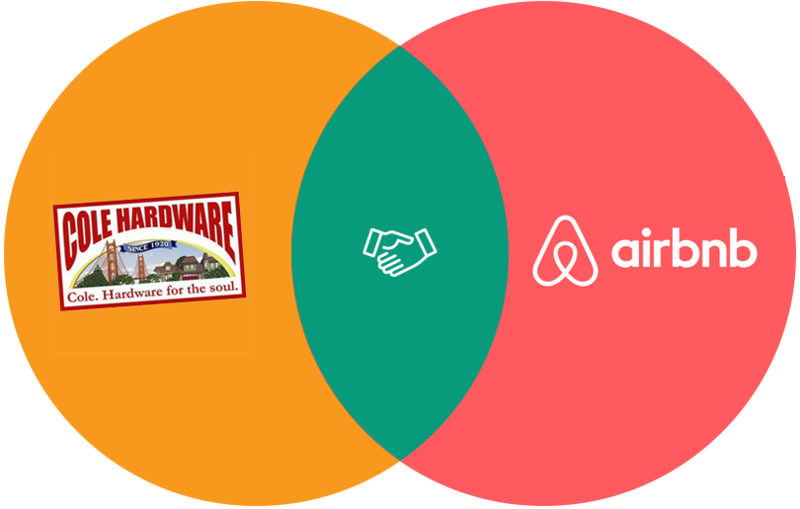 Local small business Cole Hardware and peer-to-peer home rental company Airbnb met at a SF Biz Connect event and will be collaborating.